The giant analog blockchain of Turkey! An analog blockchain has been in use for decades in Turkey. 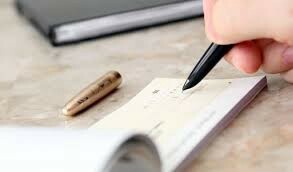 In Western countries, when you write a check to settle a debt, you are not legally allowed to sign it with a future date. (Well unless you want to leave your rent check to your landlord a week early since you are leaving for holiday). But in Turkey and in her neighboring countries, you can sign a check with a forward date and it is perfectly normal. As a matter of fact, checks with forward dates, or “vadeli” checks as they are called, are the main lubricants of the economy in Turkey. You heard it right! Anybody in Turkey, equipped with a legal checkbook from a local bank, can print her own money by signing a check with a future date, say six months ahead. When that person hands the check to a second party that she owes money to, an original and innovative economic activity begins. (These checks are similar to I.O.U.s. However in addition to checks, Turkish people also issue 150B TL worth of I.O.U.s every year). Nobody knows who first invented this creative mechanism, but most every businessmen in Turkey use and accept “vadeli” checks (In 2017, 20 million vadelis were issued at a total value of $200 Billion! Let me remind you that the Turkish GNP was $850B). Even the trade laws have been re-written to protect people from having their checks cashed at the bank before their due dates! Even with a velocity multiple of 3, that makes 600 Billion USD yearly economy created via vadeli checks. Hence, Turkey has a local, ANALOG BLOCKCHAIN that has a yearly trade volume of $0.60 Trillion! Let me briefly tell you how it works: I write a 10,000 lira check and hand it to my payee, adding that it is to be paid in full to its bearer when the time comes. Then the next person takes it and uses it to settle her debt to a third person. When she hands it to the third person, she signs and stamps the back of the check. Then the third person gives to a fourth person, again signing and stamping the back, all consecutive stamps laying orderly from left to right. These stampers are called ciranta. Mind you, Vadeli Checks are not really checks, rather they are money issued by people, since there is a future date on 99% of all checks in Turkey. As the same check changes say 10 hands, a total of 100,000 liras of debt is settled. When the back of the check is filled with signatures, next ciranta in line tapes some blank piece of paper and stamps it. So it is not unusual for a 10,000 lira check to change 13 hands in a matter of several months. Nobody knows the actual average number of cirantas per check, attached to a flying paper tail with a chain of signatures. On the due date, the last person holding the 10,000 lira check goes to the bank and cashes it. From the point of view of the bank, the activity is 10,000 liras and happens between two people (with velocity of 1). But in reality, that small piece of paper created a total of, say, 130,000 liras of economic value between 14 people (velocity=13). 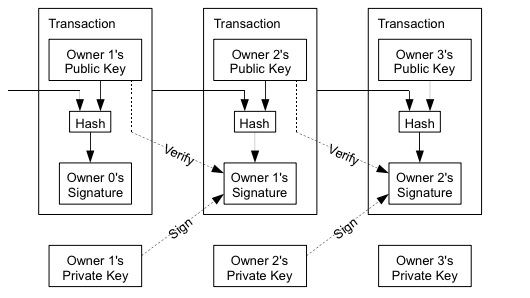 As you can see, for every transaction of bitcoins from one owner to another, there is a chain of digital signatures, which are computationally impossible to invert (hash refers to them). This structure binds each block of transaction to the next one just like a chain, that’s why it is called a blockchain. Vadeli check, with its proof of many cirantas in the form of stamps & signatures on its back, resembles the blockchain but the similarities do not end here. More than displaying addressed company stamps and signatures for authenticity, back sides of the vadeli checks also serves as a log of previous owners, if a missing funds problem happens on the due date. But the most important similarity is this: Both, blockchain and vadeli, support the act of creating new money, in their own decentralized ways. Blockchain is the support mechanism behind bitcoin, and many other distributed crypto currencies. Likewise, the mechanism of vadeli checks lets a businessman create money out of the blue, without asking permission from the central bank. Vadeli checks are the most common means of exchange among small and mid-sized businesses in Turkey. This is a uniquely local invention and one cannot see it elsewhere, since central control of money is essential in other countries. Next thing to do is to create a digital blockchain that will record our country wide activity, by giving the small enterprise owners ability to divide and spend the currency on their checks before due date and ensure security against unpaid checks.